Within the first phase of the Giantleap project, ElringKlinger, as the responsible partner for stack development, designed single cells and short stacks for laboratory experiments at partner sites. These cells and short stacks were designed to identify and study relevant degradation phenomena which are investigated by FESB. 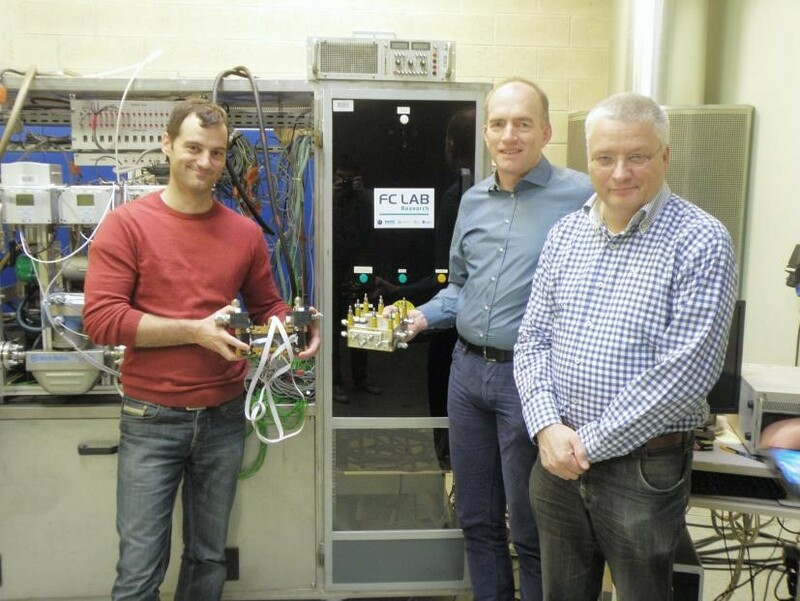 Handover of the fuel cells at FCLAB, Belfort, France: left-to-right, Dario Bezmalinović (FESB), Jürgen Kraft (EK), Ruud Bouwman (VDL). To ensure successful single cell and short stack testing at FESB infrastructure information and test rig specifications were provided by ElringKlinger in close communication with FESB. The single cell ElringKlinger designed for testing purposes uses, although showing a different design, the same materials (MEA, bipolar plates) as the full size stacks of the fuel cell range extender bus system (Figure 2). 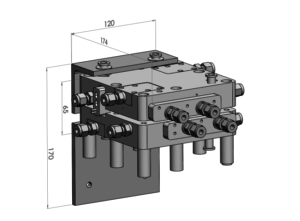 CAD model of EK metallic 50 cm² single cell designed for testing purposes. Especially the operating strategy on the anode side has a major impact on operational stability and durability of the fuel cell stacks. On full size level the stacks are operated with a passive hydrogen recirculation solution on the anode side to increase fuel utilisation and maximise the efficiency of the fuel cell bus. To characterise the influence of different recirculation parameters and the used components ElringKlinger made tests on single cell and short stack level. The evaluation of the testing results showed that on a testing level the open-end operation mode on the anode side offers far more variability to adjust relevant operating parameters such as temperature, humidity, gas composition and concentration. For the isolation and detection of different degradation mechanisms this is an interesting option which is discussed with FESB and with other scientific partners. Previous Previous post: Giantleap kicks off!